Shigeru Miyamoto, who is best known as the creator of some of the most critically acclaimed and best-selling video games of all time. Mario, Zelda, Donkey Kong, Star Fox and countless others all have Miyamoto’s fingerprints on them. 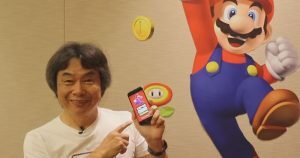 Now, Nintendo has released a video of Miyamoto playing Super Mario Run on the company’s Twitter account today, and it’s as delightful as you would expect. The legendary game designer continues playing the game even as he works out with a bicep curl and shakes hands with Nintendo’s Bill Trinen while simultaneously guiding Mario through obstacles. Miyamoto introduced Super Mario Run on stage during Apple’s iPhone 7 unveiling last week, and highlighted the one-handed nature of the game. In this side-scrolling runner, Mario will handle small jumps and hurdle basic enemies automatically, although it’ll be up to the player to make larger leaps. Super Mario Run is all set to launch for iOS this coming December on iPad and iPhone. It will come to Android at a later date.